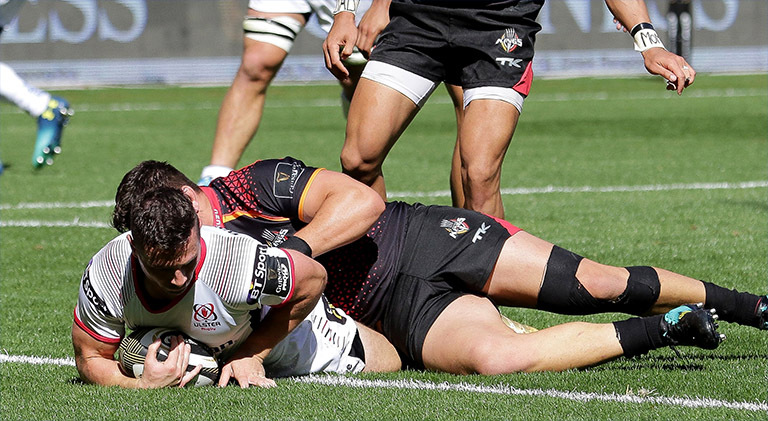 Ulster Rugby continued their perfect start to the 2018/19 PRO14 season under new head coach Dan McFarland today with a 28-7 win over the Southern Kings in Port Elizabeth. Tries from Marcell Coetzee (61′), Angus Kernohan (67′) and Angus Curtis (81′), along with three penalties from John Cooney ensured a comfortable win for the northern province in the end. Cooney’s nine points brought his tally to an astonishing 41 points this season in just three games, but he could have had even more only for an unfortunate head injury. The former Connacht and Leinster nine was taken off in the 33rd minute after picking up a nasty head gash. After the game he posted a photo online to reveal the full extent of the damage – and it’s pretty bad. Looks like Cooney will be rocking a high fade for the next few weeks!